A really nice fact about me that not many people know, is that polish sticks to my nails like nobody's business! I can rock the same mani for 2 weeks and still only have minor tipwear. I've been known to complain about a chip and have people laugh in my face, because it was just tipwear. 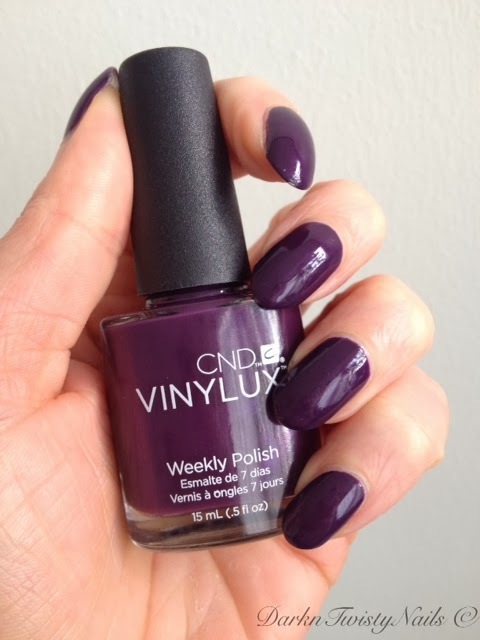 So when I first heard about CND Vinylux polish, I wasn't really that interested. Why would I spend my money on a weekly polish, if I could rock a normal polish for that long anyway? But it did stick in the back of my mind, that it might be incredible for those times I don't have time to do my nails for a longer period of time, like on holiday. If I'm gone for a couple of weeks, I just don't want to paint my nails all that often and CND Vinylux seemed like a great option, so I ordered one to test it. 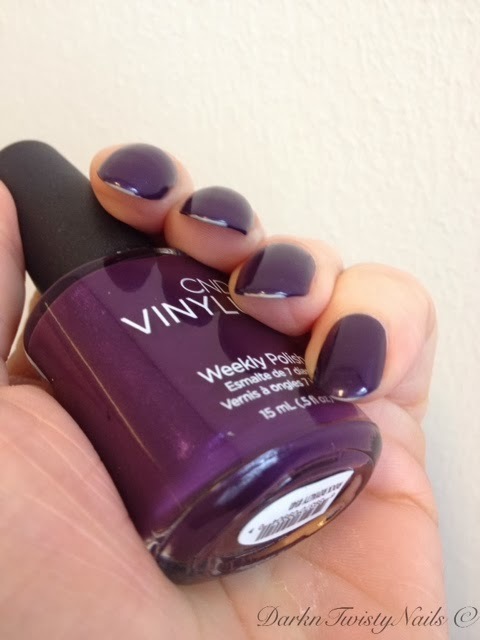 CND VINYLUX Rock Royalty is a deep plum purple cream. In the bottle it looks like a shimmer, but once it's on the nail, it's a straight up cream. The formula is really nice, it flows easily on the nail, is opaque in 2 thin coats and dried fast, although a little on the dull side. I like the color on the nail, but was a little disappointed the shimmer didn't transfer. It's a little on the boring side for me. Hmmm... no base coat necessary, I don't know... especially with a dark color like this. I opted to not listen and paint this over my normal base coat. CND also has a special Vinylux topcoat, but I, being stubborn again, opted to just use my regular top coat. I know it doesn't look like much, but for me, this is a major chip! Ok, it happens, so I wasn't ready to give up on the weekly polish just yet. But on day 2 I noticed major tipwear! I tried to ignore it and I think I did a great job, but on day 4 I just couldn't handle it anymore, this polish had to go! Overall, I like the color and formula, but a weekly polish? Nope, not by a long shot! It might be completely my own fault for not listening to CND and using a base coat and my normal fast dry top coat, but this chipped a lot sooner than a regular polish on me and it also gave me way more tipwear. 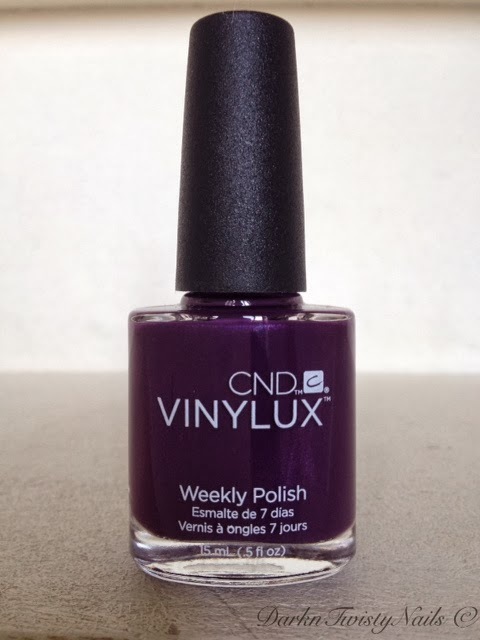 This will remain the only CND Vinylux in my collection I'm afraid. Did you try this line of polishes and what what's your opinion about them? Oh no...not good! I always have to use a base coat. My nails are not stained at all right now and I am trying so hard to keep it that way. I am with you there is no way I would attempt such a dark color. Such a shame as it does look like a nice color!